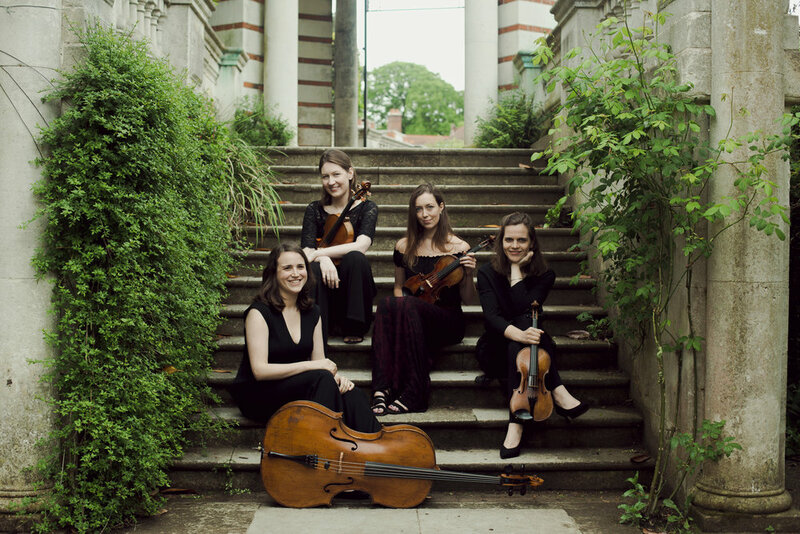 Finalists of the 2018 Royal Overseas League Competition, The Eusebius Quartet are fast gaining a reputation for imaginative and communicative performances. 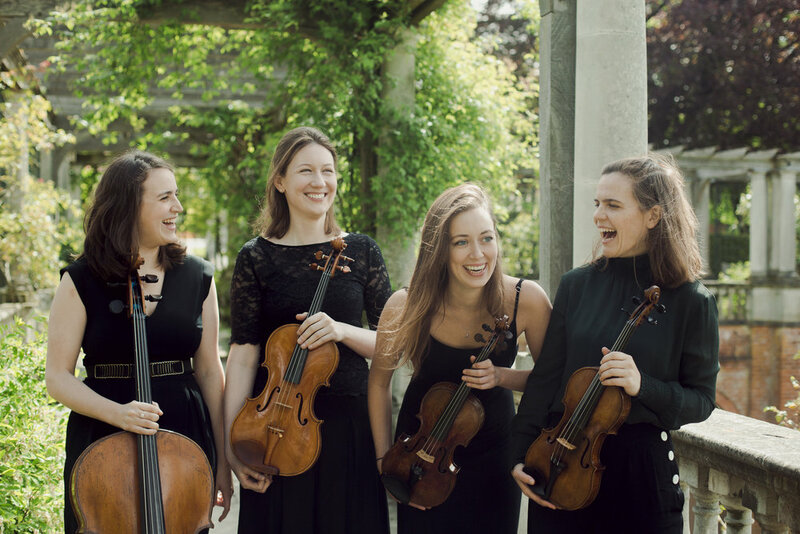 Formed in autumn 2015, they were resident String Quartet at the Lewes Chamber Music Festival 2016 and 17 and at FitzFest, Fitzrovia’s newest music festival playing quartets by Schumann, Mendelssohn, Haydn and Bartok. Since forming they have appeared at numerous London venues including Conway Hall, St James’ Piccadilly, the Foundling Museum, Blackheath Halls as well as other venues across the country. 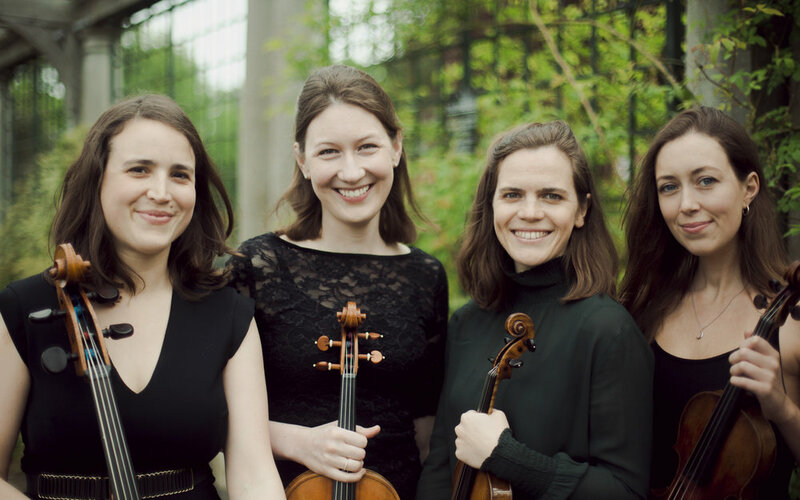 The quartet enjoys exploring unusual repertoire and last year collaborated with pianist Alasdair Beatson in three performances of Gabriel Pierné's Piano Quintet. They have also performed with clarinetists Matt Hunt and Michael Collins and bassoonist Amy Harman and oboist Daniel Bates. The Eusebius Quartet performed live on BBC Radio 3’s In Tune earlier this year before appearing as quartet-in-residence at the Wye Valley chamber music festival 2017. Here, they performed Beethoven's Opus 132 and collaborated with Marie Bitloch of the Elias Quartet in a performance of Taneyev's String Quintet No.2. The Quartet returned to the Foundling Museum in Bloomsbury, London, in February 2017 with a concert coinciding with the launch of a new exhibition "Child's Play". This project paired repertoire with particular paintings and themes from the museum's collection, preceded by a tour of local primary schools in Camden. 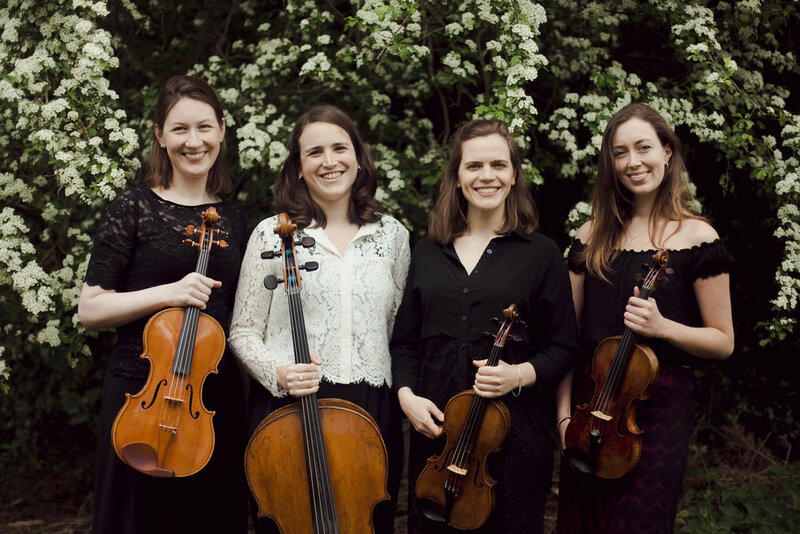 In May 2018, the quartet did a similar schools tour in Lewes, which took repertoire from the upcoming Lewes Chamber Music Festival programme to five schools in the surrounding area. These projects give these school children the opportunity to hear and interact with a professional live string quartet. The members of the quartet have played together in different formations for many years, having met as teenagers studying together and then again later at IMS Prussia Cove. 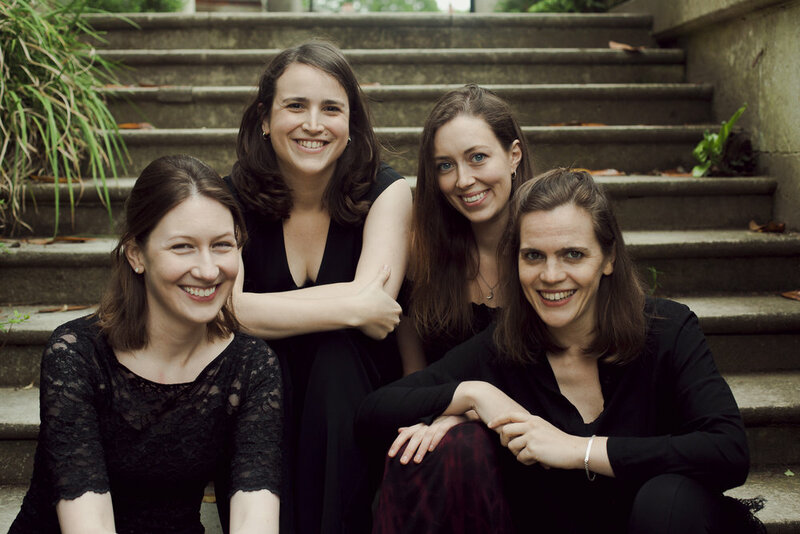 After completing studies in London, New York, Helsinki, Paris and the Netherlands they have been very excited to reunite as a quartet, sharing their passion for the extraordinary music written for this formation. The quartet enjoys experimenting with different styles of playing, studying early Haydn editions as well as string quartet recordings made in the twenties and thirties and feel extremely lucky to have this opportunity to spend their lives exploring the intricacy and importance of fine quartet-playing today. The quartet takes its name from one of the two fictional characters invented by Robert Schumann for his musical journal writings. These characters became symbolic of Schumann’s opposing moods: the fiery and impassioned Florestan contrasted the more introverted and dreamy Eusebius. Beatrice Philips enjoys a busy and diverse freelance life as a much sought-after chamber musician, soloist, orchestral leader and teacher. She is first violinist of the Eusebius Quartet, which is fast gaining a reputation for its imaginative and communicative performances, and has appeared in numerous leading chamber music festivals. 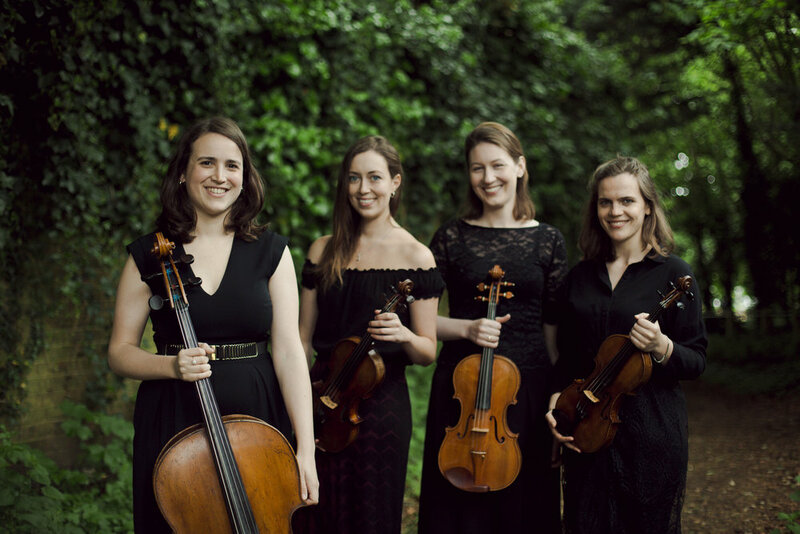 Beatrice herself, founded and directs the Lewes Chamber Music Festival which, now in its sixth year, is a significant annual musical event attracting many world-renowned performers. Beatrice also enjoys historical performance on period instruments, with which she has played much chamber music, leading groups such as Arcangelo, directed by Jonny Cohen and performing with the Monteverdi Choir and Orchestra directed by Sir John Eliot Gardiner. Beatrice was last year guest Principle second violin with the Welsh National Opera, working under Carlo Rizzi, Lothar Koenig and Rinaldo Allessandro and will return to that role for part of their Spring season. Beatrice gained a First Class music degree in 2007 from Kings College London university during which she studied violin at the Royal Academy of Music with Howard Davis. Following this, she went on to complete a Masters at the Sibelius Academy in Helsinki, where she studied with Erkki Kantola and Paivyt Meller. During her Masters she studied for one year on exchange in Paris with Olivier Charlier at the CNSM in 2009. She has appeared at many festivals including Cheltenham, Kuhmo, Oxford Chamber Music Festival, Two Moors, Resonances, IMS Prussia Cove, Hatfield House, FitzFest, Presteigne and has broadcast on BBC Radio 3 with the Eusebius Quartet. As a soloist she has given performances of concertos by Mendelssohn, Mozart, Sibelius, Bruch, Vivaldi, Bach and Tchaikovsky with orchestras throughout UK and in Europe. Beatrice currently plays a composite Stradivarius violin kindly on loan to her. Venetia recently completed her Masters in Performance with distinction at the Guildhall School of Music and Drama where she studied with David Takeno and was generously supported by the Guildhall School Trust and the Albert and Eugenie Frost Trust. She previously studied with Krysia Osostowicz, receiving First Class Honours, the Concert Recital Diploma and the Donald Weekes Memorial Prize from her studies at the Guildhall School. Since graduating, Venetia has performed in a variety of settings from concert halls to recording studios. She plays regularly with the 12 Ensemble with whom she has appeared at Kings Place and the Barbican as well as on tour in South Korea and at their Aldeburgh residency. As a member of the Eusebius Quartet, she has performed on BBC Radio 3’s ‘In Tune’ as well as at festivals and concert halls throughout the UK. She is concertmaster of the Janus Ensemble and plays with other orchestras such as Sinfonia Cymru and the London Chamber Orchestra. Venetia also enjoys exploring different genres of music, having performed and recorded for funk/soul singer Nikka Costa during her UK tour and for London-based pop band We Used to Make Things. She was also fortunate to perform at London Fashion Week in February for the Le Kilt show. Venetia has participated in masterclasses with distinguished artists such as Andras Keller, Nikolaj Znaider, Rodney Friend, Ferenc Rados, Erich Hobarth, Leland Chen, Maciej Rakowski and members of the Belcea, Takćas, Alban Berg and Endellion quartets. Venetia has taken part in numerous festivals and concert series around the world including IMS Prussia Cove, Britten Pears Young Artist Programme, Lewes Chamber Music Festival, Wye Valley Festival, Cadenza International Summer School and Lausanne Summer Academy, where she has worked with some of the world's most prominent musicians. Venetia plays a violin by Vincenzo Panormo from 1800 with a Hill & Sons bow, both of which are generously loaned by the Harrison Frank Foundation. Violist Hannah Shaw (b. 1984, South Carolina, USA) enjoys a career spanning a wide variety of musical styles. As a chamber musician, Hannah has performed throughout Europe and the US as a member of The Hague String Variations and Trio De Kooning, as well as with such musicians as Liza Ferschtman, Dimitri Ferschtman, Atar Arad, Elisabeth Leonskaja, Gordan Nikolic, and Michel Strauss, among others; and she appears regularly at such festivals as Open Chamber Music at Prussia Cove, Festival de Musique de Chambre à Giverny, Grachten Festival, Kneisel Hall Chamber Music Festival, and Casalmaggiore International Festival. Through her interest in contemporary music, Hannah performs regularly with the Asko|Schönberg Ensemble; has collaborated with such notable composers and conductors as Reinbert de Leeuw, Kaija Saariaho, Peter Eötvös, Huang Ruo, Heinz Holliger, Eliott Carter, Louis Andriessen, Sofia Gubaidulina, and James MacMillan; has had works written for her by Pulitzer Prize winner Caroline Shaw, Victoria Cheah, and Timo Andres; and has appeared in the Acht Brücken Festival, Saariaho Festival Den Haag, Huddersfield Contemporary Music Festival, Holland Festival, Juilliard's Focus! Festival, and MoMA's Summergarden series. With Trio De Kooning, she received a grant from the Netherlands-America Foundation for her presentation of contemporary works for string trio. Hannah has also served as guest leader with a number of orchestras, including BBC National Orchestra of Wales, The Hague Philharmonic, and Arnhem Philharmonic; and can regularly be heard playing with the Rotterdam Philharmonic, Nederlands Kamerorkest, and the Noord Nederlands Orkest. Hannah received her Bachelor of Music degree with honors from the Oberlin Conservatory of Music, where she was a student of Roger Chase. She was awarded a Master of Music degree from The Juilliard School, where she studied with Samuel Rhodes of the Juilliard String Quartet. An avid chamber musician, she has participated in Thy, Domaine Forget, Lewes, Wye, Taos and Kneisel Hall Chamber Music Festivals. Hannah has performed as a soloist with the Blackheath, Finchely, Haydon, Lambeth and Juilliard Orchestras. With the Juilliard Orchestra in 2009, she performed Tan Dun’s Concerto for Six with the composer at Alice Tully Hall. Hannah retains musical links with the USA, and regularly performs recitals in Boston, San Francisco, New York and Santa Fe with pianists Allegra Chapman and Jillian Zack. Hannah teaches the cello at Alleyn’s School and Junior Royal Academy of Music. She is very grateful to play a Piattellini cello, which is kindly on loan to her from the Stark family. In October 2017, the Eusebius Quartet started an annual Friends membership scheme. The Friends support a variety of special projects undertaken by the Eusebius Quartet throughout the year, the first of which will be the production of the Quartet's first CD to be released in January 2018.